It's twilight outside O'Connor's bar on Fifth Avenue, Brooklyn. It's always twilight inside. The upper reaches of the narrow, high-ceiling room seem to fade into a dark night sky up near the old tin ceiling, and the lighting below is never too bright. Which is a good thing. People don't come in this old place to see things clearly or shine a spotlight of their life's progress. 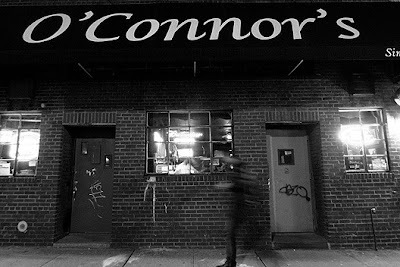 People come here for a respite from the daily grind, to be reminded that some bars still serve the same escapist purpose they did in the 1930s, when O'Connor's opened. A beer, a tune from the jukebox, a temporary loss of memory, a bit of weightless, nonconfrontational rapport with your fellow man. Most of the men lining the bar on a recent evening kept their winter coats on, as if shielding themselves from the cold, cold world. They made for a slightly shabby crew, but longtime bartender Chris served each with respect, alacrity and good humor. You don't hear much about the owner at O'Connor's (who is not named O'Connor—he died a few years back), but everyone likes Chris. He looks like a figure clipped from an old photograph of a 19th century bar: tall, fit, bald and with a moustache. He hustles when, given the clientele (nobody's in a rush to go), there's no need to, and if he gives you the wrong change for the weirdly eclectic juke box (The Waterboys, Hank Williams, Syd Barrett), he makes up for it but shoving in some dough himself. There's a line of old, beaten booths, some composed half of wood, and half of what looks like couch cushions or the back seat of a Chevy. But the regulars seem to prefer the equally beaten metal bar stools, so as to be closer to Chris and the booze and the soundless televisions. I was pretty sure some of the patrons didn't exactly have a home to go back to. Others who did, like a young husband who was expecting a child soon, weren't missing the hearth too much. When he finally got up to go, he announced his intention to hit Freddy's Bar, and that he would be back tomorrow at the usual time. Conversation varied, but never died. One man walked in with the huge news that the new LIRR Atlantic Avenue Terminal Pavilion had finally been unveiled. "It's bee-ootiful!" he declared, as if he had just seen the Aurora borealis. An old, bent man on the way to the bathroom instructed this writer to not "give up the ship." There were amused remembrances of the youngsters who had to be instructed on how to use the rotary phone in the bar's old wooden booth. (O'Connor's has to pay the phone company to keep it.) And the owner was mocked for his plans to spruce up the place and add a kitchen and back party room, "so nice people won't have to see this dirty bar." He's also responsible for the TVs, apparently, and the new awning outside. Why would anybody buy a place like this with the idea of "fixing" it? It's bee-ootiful.